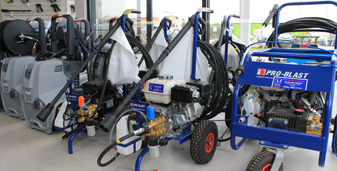 We have a range of water blasters and pressure cleaners in hot and cold models available for hire. Our cold water blasters are available from 11 to 50 LPM and our hot water pressure cleaners are available from 11-21 LPM. Our friendly team are able to help you choose the right machine for your requirements. Please contact us for more information! 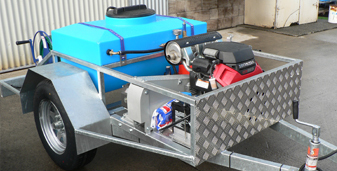 Our cold water blasters are available for hire from 11 to 50 LPM. 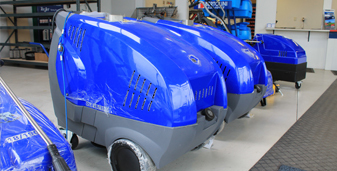 They are ideal for a variety of cleaning needs including house and concrete cleaning. We also have accessories available including longer telescopic lances. Our range of hot water pressure cleaners are available for hire from 11-21 LPM. Hot water blasters are great for cleaning grease and very dirty surfaces quickly. We also have a range of accessories for hire that can make your cleaning job easier. Our Trailed Water Blasters are ideal for commercial and industrial applications and come with high capacity water tanks. Please contact us for more information and we will help you find the right solution for your needs.